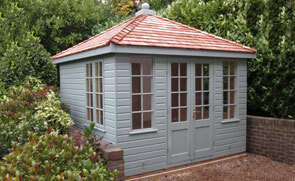 Installed Buildings in Hampshire - Delivery & Installation Incl. One of our charming Holkham Summerhouses was recently designed and hand-built at our Norfolk factory before being delivered to the customer in Southampton, Hampshire. Crafted using only the finest FSC® certified timber and almost 50 years of expertise, the Summerhouse was then delivered and installed at the customer’s address by our in-house fitting team. One of our classically attractive Blakeney Summerhouses was recently installed for a customer based in Farnborough, Hampshire. Measuring 3.0 x 2.4m, the building was designed and built by hand at our Norfolk factory before being delivered and installed by our expert fitting team. 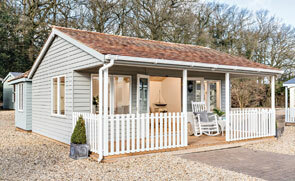 This stylish Salthouse Studio was recently installed for a customer based in Southampton, Hampshire. 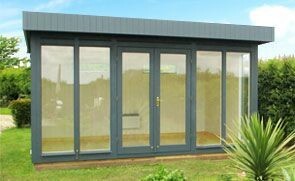 One of our most popular garden studios, the entire building is designed and fabricated at our Norfolk factory using only the finest FSC® certified timber and double-glazed windows. 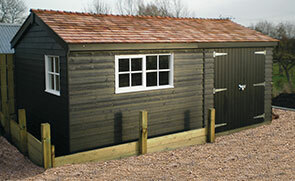 All of our buildings include both delivery and installation done by our expert in-house fitting team. This Superior Shed in our Valtti paint shade of Pebble was recently installed in Ringwood, Hampshire for a customer who needed a functional and aesthetically pleasing workshop. The apex roof is coated with grey-slate composite tiles to protect the building from the elements, as well as looking more attractive than standard felt. The roof also has a slight overhang on the gable end over the entrance doors. This attractive Burnham Studio has been installed to overlook our customer’s garden in Alresford, Hampshire to allow the customer to move their home office into their garden, away from the hustle and bustle of the house. This Superior Shed has been installed at our customer’s new house, along with a Wiveton Summerhouse, in Andover, Hampshire to add some style to their previously empty garden.